Whether you are upgrading or looking for a brand new ceiling fan for your home it is nice to know you have a number of options when it comes to styles of ceiling fans including western ceiling fans. Western ceiling fans could fit in an array of scenarios and some would look right at home in an early Clint Eastwood western. Below we have compiled a list of some of the coolest western ceiling fans available. It doesn’t get any more western than this. 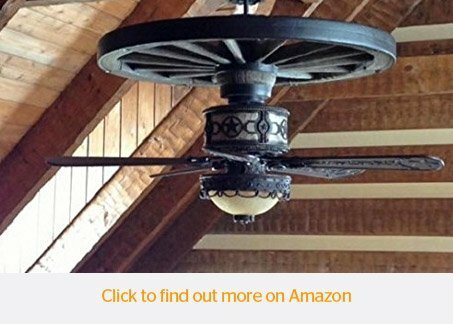 The Western Star Wagon Wheel ceiling fan comes in a number of different sizes ranging from 52-inch blades with a 32-inch wheel all the way up to 60-inch blades with a 42-inch wheel. This western style ceiling fan features a molded and hand-painted resin wagon wheel replica on a rustic finished fan. You can even get this beauty complete with a light kit to light up those dark places and always ensure people can see this unique fan in your home or workplace. The fan comes with a 3 Speed Reversible 172MM x 17MM Motor which is controlled in a traditional old school western way with a pull chain to control the speeds. 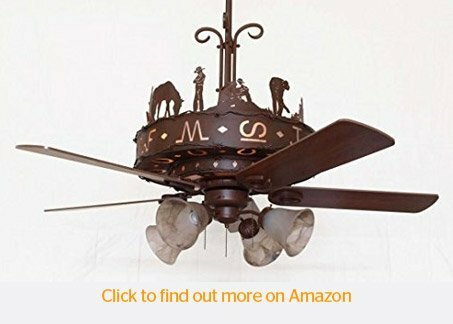 The crafting around the fan is made of bronze and features a bucking bronco scene which is highlighted with antique gold. This fan comes with a CFM rating of 6066CFM. This fan is perfect for your great room or any western themed room and is always a great talking point for your visitors. This fan is fairly similar to the Western Star Ceiling fan above. It comes it the 52 inch or 60-inch blade size. 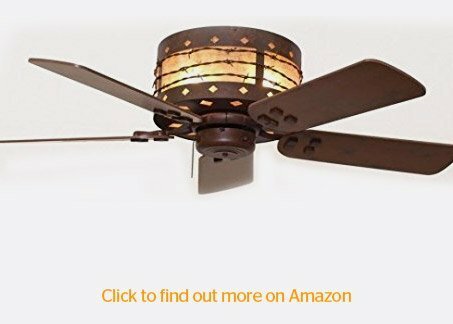 The main difference with this ceiling fan is the bronze crafting around the fan along with the inclusion of the light kit upon purchase of this western style fan. It is a little bit more powerful than the Western star fan with a CFM rating of 7200CFM. Both this and the Western star fan are made in the USA. The Sheridan wagon wheels feature molded wood grain and a multi-layered, hand painted finish for an authentic look. As far as western ceiling fans go this will most certainly be the centerpiece of any room. How about having integrated art built into your western ceiling fan. 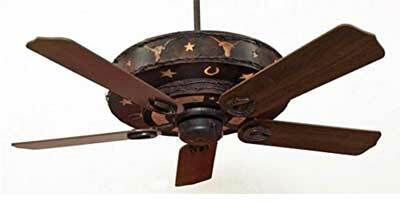 This western fan has multiple levels of design starting with the beautiful scenes (of which there is a number available for you to choose from) moving to the authentic barbed wire which is hand wrapped around the edges to the beautiful western, rustic style which will no doubt turn heads. You can get this fan in the 52 inch or 60-inch version, but not only that, you are able to purchase with or without the light kit, whichever suits your needs best. The Western Trails Ceiling Fan comes with a 6700 CFM rating with a 3 Speed Reversible 188MM x 25MM Heavy Duty Size Motor. In keeping with the authentic western style, the speed settings are managed with a pull chain. The mountainaire western style ceiling fan is some more handcrafted beauty made in the USA. Like the above, this fan is handcrafted for you specifically. Not only are you able to get various custom made designs around the lighting but you can also choose the type of fan blade you want. This fan, in particular, has an illuminated center motor cover which radiates a beautiful ceiling glow. Depending on your needs you are able to purchase the fan with 44-inch blades or if you are needing a bit more size you can grab the 52-inch blades. If you are after a bit more than just ambient light you are able to purchase a light kit that fits comfortable at the bottom of the fan. The fan uses 4-7W long life candelabra bulbs, which are included, on a separate circuit to allow for individual control of the top and bottom lights. The Mountainaire Western Ceiling fan comes with a 3 Speed Reversible 172MM x 17MM Motor and in true western style features a pull chain for fan speed control. The fan comes with a CFM rating of 5852. Upon purchase of this fan, you will get a lifetime Motor Warranty and 1-year unconditional warranty on everything else. Be sure to check out the different designs that are avaiable. The Hampton Bay “Lonestar” western style ceiling fan has a theme straight out of Texas Hill country. You can bring a taste of the southwest to your decor with this fan. Available in 52 inches this fan is a little more modern than the above fans in that it comes with a remote control, so no pull chain on this one and you will not be able to control the fan on the fan unit directly. The fan is able to be reversed so you stay cool in summer and warm in winter. The Lonestar ceiling fans are one of a few western ceiling fans with stars as part of their feature design. The fan features the handcrafted look of fine wrought iron and incorporates graceful sweeping shapes and a Texas star pattern in Aged bronze finish. The light fixture is integrated into the design and is made or warm tea-stain glass. Rope wire accents at the outer edge of the walnut finished fan blades provide a classic finishing touch. This fan is a dual mount which means it can be mounted on a flat or angled ceiling for your convenience. It comes with a 1-year warranty. If you are on the hunt for western ceiling fans it really is a good news, bad news scenario. The bad news is the selection is unfortunately limited. Although there are a number of different customization available within the fans that are available, there really are not a whole lot of western ceiling fans available. The good news is that what is available is really quite amazing. 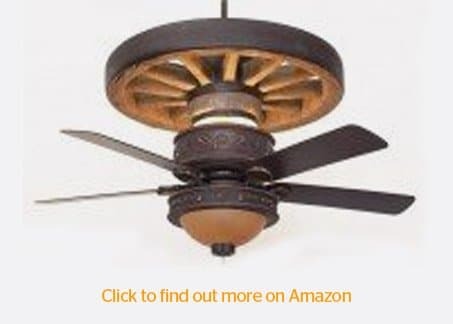 The company that makes a lot of the western style ceiling fans hand make a lot of the fans. The are unique and have a lot of TLC involved in their creation. You can be sure there will very few people with the same centerpiece in their home. Copper Canyon make a lot of nice ceiling fans and in this case they have delved into the western world the Longhorn Ceiling fan. 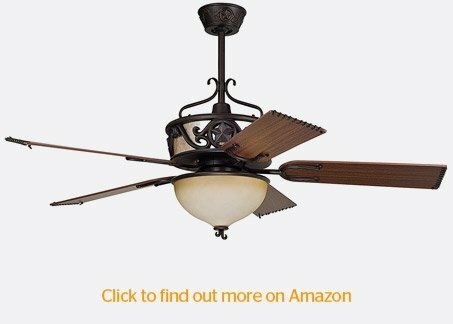 This ceiling fan is 60 inches, which is a very large size and comes with 3 speeds. The fan is reversible so you are able to change the direction of the fan and use it all year round to help control the temperature of your home. The Longhorn ceiling fans also comes with a light kit included. The walnut teak blades compliment a rustic style base which has a barbed wire design with the feature ‘longhorn’ design and as with the Hampton Bay above, is one of only a few western ceiling fan with stars. It has a high performance in terms of moving air blowing out a large 6700 CFM at 94 Watts giving it an reasonable airflow efficiency rating of 71.3. Have you purchased any of these ceiling fans? We would love to know what you thought. Feel free to leave a comment below with your comments.